Though Ant-Man is primarily concerned with introducing audiences to Scott Lang (Paul Rudd) - set up to become the littlest Avenger - it's also tasked with laying down a foundation for things to come in Marvel's shared movie universe. The gears of the machine are always turning, and everyone wants to know what's next. It's for that reason that Marvel Studios has turned to mid/post credits scenes to tease their future plans. Peyton Reed's Ant-Man is no different, as its closing buttons provide plenty of groundwork for the shape of the MCU going forward [read our Ant-Man End Credits and Captain America 3 Explained post]. By the end of the film, Scott is promised a partner in heroics, soon to be joined in costume by Hope van Dyne (Evangeline Lilly), who is all but set to take up the mantle of the Wasp and follow her mother's footsteps. The scene in question will excite longtime comics readers, but may leave casual audiences confused. Read on for our explanation of Wasp's past and future in the MCU. In Ant-Man, it's established that Hank Pym (Michael Douglas) and his wife Janet were once agents of S.H.I.E.L.D., operating in the field as Ant-Man and Wasp. The duo's suits were powered by Hank's revolutionary "Pym particles," which allowed them to shift in size in order to complete their missions. In an effort to stop a Russian ICBM, Janet sacrificed herself, falling into the quantum realm after she overrode her suit's safety features and shrunk to subatomic size. As a result, Hank was left a broken man and shelved all of his Pym particle research, before it was uncovered by Darren Cross (Corey Stoll). During the mid-credits scene, Hank reveals to Hope that he and Janet had been developing a new Wasp suit prototype, saying with a smile that he realizes they were making it for their daughter. Just as "Ant-Man" is a title to be passed on, the time has come for there to be a new Wasp fighting with Earth's Mightiest. And since Hope always displayed an eagerness to don the Ant-Man costume and perform Scott's heist herself, she's clearly willing to accept her father's offer and become a superheroine. Given that Lilly has signed the standard Marvel multi-picture contract, she's sure to factor into upcoming projects on the slate. So now that there's officially another soon-to-be Avenger to keep track of, newcomers are probably wondering what sets Wasp apart. Going off of the source material, the character has a number of skills and abilities that would be beneficial in a fight against whatever evil forces come Earth's way. Like Ant-Man, she can shrink via the Pym particles and communicate telepathically with insects to even the odds. She can also grow to giant size, but that's something she only uses in the case of an emergency. Wasp does have other powers to make her more than just a Scott Lang copycat. The comic version of Wasp can fly once she shrinks to miniature size, thanks to a pair of translucent wings - a result of genetic modification. She is also able to harness her body's bio-electric energy and shoot "stinger blasts" from her hands. 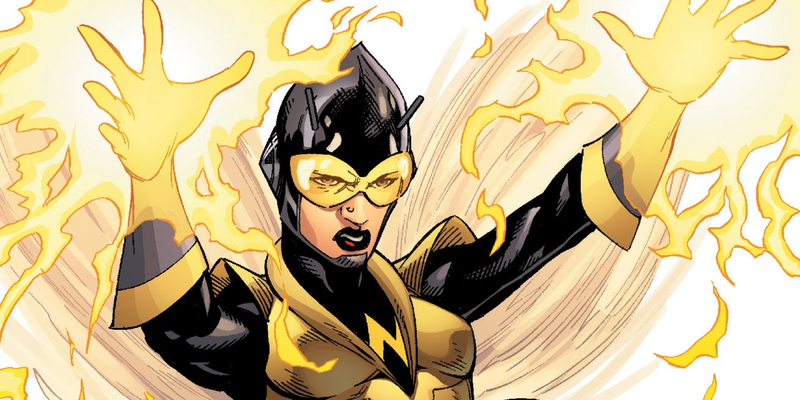 Initially, she required the use of wrist devices to release these (think Spider-Man's web shooters), but her repeated exposure to Pym particles allowed her to shrink and produce the "wasp's stings" naturally without aid. Based on the film, we expect the MCU Wasp to maintain a good deal of these powers, but not be a direct translation from page to screen. It's true that certain elements will be featured in the movies, namely Wasp's ability to fly: Janet is shown using the same wings when trying to take down the missile. It's also plausible that the wasp stingers will be showcased in some capacity, but without knowing the full breakdown of the costume, it's hard to guess. But the wings seen as part of the suit imply the films won't be adopting their alternate origin.